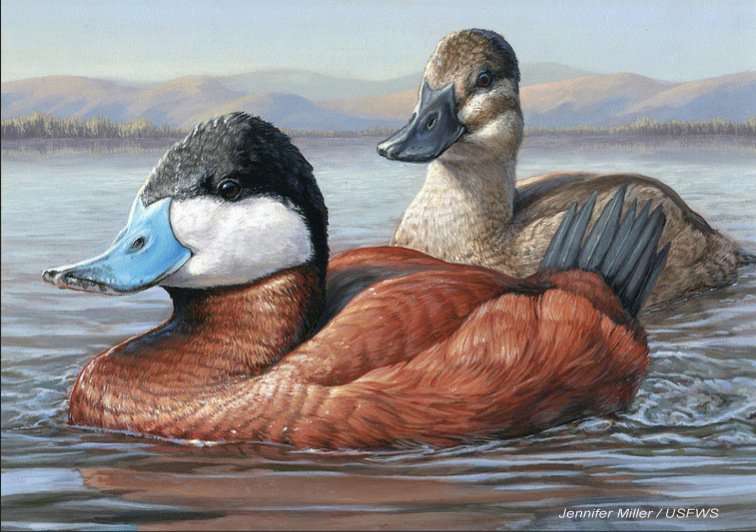 Jennifer Miller and her Ruddy Ducks won the 2014 art contest for the 2015-2016 duck stamp. The stamp will go on sale in June, 2015. 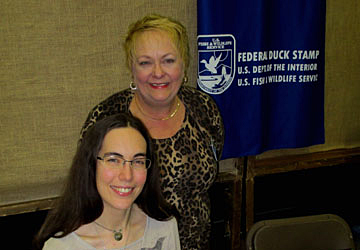 Artist Jennifer Miller at the 2014-15 Duck Stamp Award ceremony, with Laurie Shaffer, head of the Federal Duck Stamp Office. You can learn more about Jennifer –- and see more of her work -- on her website, featherdust.com. Sales of the federal duck stamps -- a program managed by the US Fish and Wildlife Service -- are vital for wetland conservation: "ninety-eight cents out of every dollar generated by the sale of Federal Duck Stamps goes directly to purchase or lease wetland habitat for protection in the National Wildlife Refuge System." learn more about the duck stamp program. Learn more about BirdNote partner, Ducks Unlimited. BirdNote has more about the history of the duck stamp program!